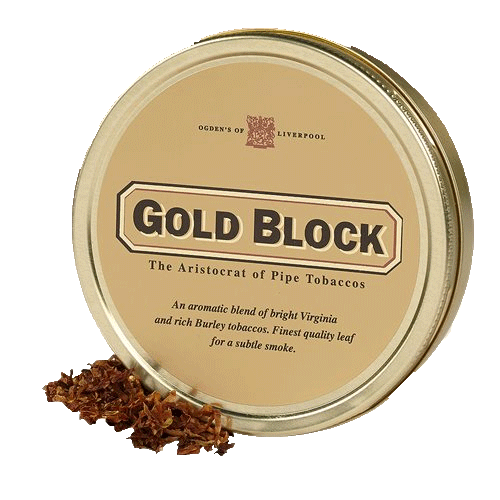 Gold Block Pipe Tobacco | Chicago's Pipe, Cigar & Tobacco Store | Iwan Ries & Co.
Gold Block from Ogden's of Liverpool was known for being one of the most widely available pipe tobaccos in the UK. This smooth and relaxing blend of sweet, bright Virginia and mellow white Burley is treated to a pleasant top note which allows the user to get real tobacco flavor, while delivering an enticing room note. For anyone who is looking for and all-day blend, or for a lightly flavored tobacco for earlier in the day, Gold Block is certain to please.